This adjustable sofa establishes a relaxing atmosphere with charming designs. Tufted cushioned seating is plush and full of comfort. Exposed tapered wood legs complements the upholstery, which is available in a brown leather or a sage fabric. The center seat-back cushion folds down to conveniently create a snack tray with cup-holders. Further, the entire seat-back pushes back to provide a larger area to rest. 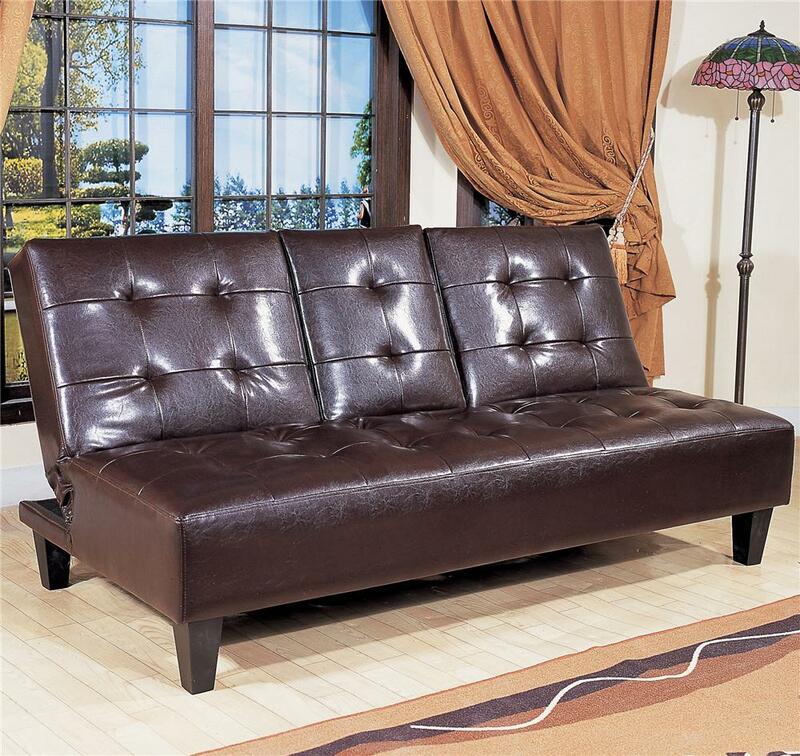 Welcome this adjustable sofa into your living room or bedroom to accomplish a relaxing and cozy atmosphere. The seat depth is 22", and the width of the futon with the seat back folded down flat is 44.5". The Futons & Daybeds Adjustable Sofa with Snack Tray by Crown Mark at Miskelly Furniture in the Jackson, Pearl, Madison, Ridgeland, Flowood Mississippi area. Product availability may vary. Contact us for the most current availability on this product. Leg or Skirt Available with either exposed tapered wood legs or metal rounded legs. The Futon & Daybeds group works to create a warm and cozy atmosphere in your home. The tufted cushions offer ultimate comfort, while exposed legs add style. Choose between leather, fabric, or metal construction depending on your particular needs. Bring this group into your living room or bedroom to establish a favorite spot to read your favorite book, watch a movie, or to simply nap. The Futons & Daybeds collection is a great option if you are looking for Transitional furniture in the Jackson, Pearl, Madison, Ridgeland, Flowood Mississippi area. Browse other items in the Futons & Daybeds collection from Miskelly Furniture in the Jackson, Pearl, Madison, Ridgeland, Flowood Mississippi area.